Don't let a dry, itchy scalp cramp your style. Head &amp; Shoulders Dry Scalp Care Anti-Dandruff 2 in 1 Shampoo &amp; Conditioner nourishes your scalp three surface layers deep to help prevent dryness, flakes and itch. * With a pH-balanced formula brought to you by America's #1 dermatologist recommended brand, your hair has never been in better hands. Add this almond oil-infused 2 in 1 to your routine to help you say goodbye to flakes, itch, irritation … and holding back. *dryness, flakes and itch associated with dandruff, with regular use flakes, itch, and irritation associated with dandruff, with regular use Regular use of Head &amp; Shoulders anti dandruff products nourish your scalp three surface layers deep to prevent dryness, flakes and itch, associated with dandruff. The Head &amp; Shoulders collection includes clarifying shampoos, volumizing conditioners, and 2 in 1 combos, so you can introduce dandruff treatment to every step of your hair care routine. With a pH-balanced formula brought to you by America's #1 dermatologist recommended brand, you can count on Head &amp; Shoulders to combat seborrheic dermatitis, and other irritable and itchy scalp conditions associated with dandruff. Head &amp; Shoulders products come in a variety of scents and formulas, and include ingredients like almond oil, tea tree oil, lemon extract, and peppermint. The shampoo &amp; conditioner system are safe to use on color treated, curly or textured hair types, compared to a non-conditioning shampoo. Don't let a dry, itchy scalp cramp your style. Head & Shoulders Dry Scalp Care Anti-Dandruff 2 in 1 Shampoo & Conditioner nourishes your scalp three surface layers deep to help prevent dryness, flakes and itch. * With a pH-balanced formula brought to you by America's #1 dermatologist recommended brand, your hair has never been in better hands. Add this almond oil-infused 2 in 1 to your routine to help you say goodbye to flakes, itch, irritation … and holding back. *dryness, flakes and itch associated with dandruff, with regular use flakes, itch, and irritation associated with dandruff, with regular use Regular use of Head & Shoulders anti dandruff products nourish your scalp three surface layers deep to prevent dryness, flakes and itch, associated with dandruff. The Head & Shoulders collection includes clarifying shampoos, volumizing conditioners, and 2 in 1 combos, so you can introduce dandruff treatment to every step of your hair care routine. With a pH-balanced formula brought to you by America's #1 dermatologist recommended brand, you can count on Head & Shoulders to combat seborrheic dermatitis, and other irritable and itchy scalp conditions associated with dandruff. Head & Shoulders products come in a variety of scents and formulas, and include ingredients like almond oil, tea tree oil, lemon extract, and peppermint. The shampoo & conditioner system are safe to use on color treated, curly or textured hair types, compared to a non-conditioning shampoo. For external use only.When using this product.Avoid contact with eyes. If contact occurs, rinse eyes thoroughly with water.Stop use and ask a doctor if.Condition worsens or does not improve after regular use of this product as directed.Keep this and all drugs out of reach of children. If swallowed, get medical help or contact a Poison Control Center right away. Inactive Ingredients: Water, Sodium Laureth Sulfate, Sodium Lauryl Sulfate, Dimethicone, Cocamide MEA, Zinc Carbonate, Glycol Distearate, Sodium Xylenesulfonate, Fragrance, Cetyl Alcohol, Guar Hydroxypropyltrimonium Chloride, Magnesium Sulfate, Sodium Chloride, Sodium Benzoate, Magnesium Carbonate Hydroxide, Benzyl Alcohol, Prunus Amygdalus Dulcis (Sweet Almond) Oil, Methylchloroisothiazolinone, Methylisothiazolinone. Ingredients: Active Ingredient: Pyrithione Zinc 1% Inactive Ingredients: Water, Sodium Laureth Sulfate, Sodium Lauryl Sulfate, Dimethicone, Cocamide MEA, Zinc Carbonate, Glycol Distearate, Sodium Xylenesulfonate, Fragrance, Cetyl Alcohol, Guar Hydroxypropyltrimonium Chloride, Magnesium Sulfate, Sodium Chloride, Sodium Benzoate, Magnesium Carbonate Hydroxide, Benzyl Alcohol, Prunus Amygdalus Dulcis (Sweet Almond) Oil, Methylchloroisothiazolinone, Methylisothiazolinone. Instructions: For best results use at least twice a week or as directed by a doctor. For maximum dandruff control; use every time you shampoo. Shake before use. Wet hair; massage onto scalp; rinse; repeat if desired. After using the head and shoulders dry scalp almond oil 2 in 1 shampoo and conditioner I can say it was a miracle! I had really bad dry scalp and flakes after shampooing once with head and shoulders I can say My scalp is smooth healthy clean, my hair smells good and I am so happy! Thanks Head and shoulders! I will continue using this product you save my hair! So thankful! To my amazement, this 2 in 1 works better than the $80 worth of professional products I normally use. My hair is so soft and silky. It's not frizzy and I was able to comb through it without a bunch of tangles (I have long, thick, curly hair). Oh, and it smells great too! Goodbye over-priced salon brand! Product is AMAZING! Good quality, great price. My scalp was EXTREMELY dry. I gave this product a try and YES IT IS AMAZING! My favorite by far! I&#39;ve tried LITERALLY everything.My hair is so soft an i definitely see improvement! It Had an Unexpected Side Effect for Me! I live in Florida, where the humidity is ridiculous.I've never had a problem with frizzy hair until recently.I've tried all brands, it seems. The other day I saw this on sale, so I bought it. (I do not have dry scalp, by the way.) 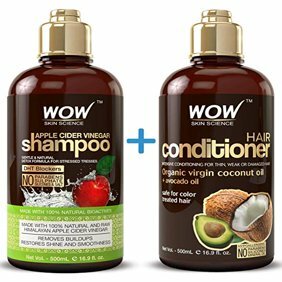 This product has completely resolved my frizzy hair problem.I don't know if it's the conditioner or the almond oil or what, but I am thrilled. THANK YOU! Head and Shoulders is doing something right!! I just moved and suddenly got dandruff for the 1st time. I tried Dove scalp care which was ok, but 3 days ago switched to head&shoulders because they offer a larger size. Since then my fiance keeps asking what I'm doing different because my hair is so much softer, shinier, and smells even better than before! I agree! It's helped more than just dandruff!